Hey, are you feeling lucky? Use the code MYSTERY on your next deposit for a chance to win a casino bonus prize of $25 to $100! CanPlayCasino players who deposit a minimum of $25 with deposit code MYSTERY between November 27th and November 28th will receive a mystery bonus prize between $25-$100 (total of $600). 15 winners will be randomly selected to win the mystery bonus prize. The casino bonus and deposit carry a 30X playthrough requirement and expire in 15 days. Promotion dates are between November 27th and November 28th 2018, ending November 28th at 11:59 PM EST. The bonus will be awarded within 72 hours of promotion’s end. Winners will be posted on the Mystery webpage 72 hours of promotion’s end. Players who deposit with a promotion code on their first, second or third deposit will be exempt from the New Player Deposit Bonus. After the player’s account is credited with the Bonus Dollars and the player starts a new game session, the Bonus Dollars will be used first. Any winnings first replenish the bonus and then are used next. Upon completion of wagering requirements, any winnings will be credited to player’s unrestricted account balance, and any subsequent wagers will be debited from the unrestricted account balance. The playthrough contribution percentage for casino games varies, please view our Bonus Wagering Requirements page for more details. 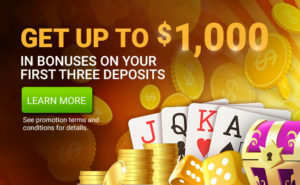 CanPlayCasino is a free service, sign-up opportunities exist via CanPlayCasino.com. 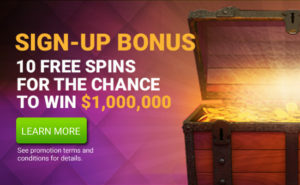 Employees of CanPlayCasino and their respective subsidiaries, affiliates, agents and promotion companies, and advertising agencies involved in this promotion are not eligible to participate. 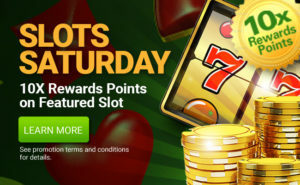 CanPlayCasino reserves the right to change or cancel this promotion in its entirety at any time. CanPlayCasino also withholds the right, at its discretion, to exclude any individual or individuals from participation. All general CanPlayCasino Terms & Conditions apply.